The last time Steve Jobs got on an earnings call, it was to reassure investors that he was in good health. So what made him spend an hour taking questions today? Here's what Jobs said, and what it means. Apple Quarterly Earnings: 6.9 Million iPhones Sold, "More Phones Than RIM"
We've now passed RIM and I don't see them catching up with us in the foreseeable future. They must move beyond their area of strength and comfort into the unfamiliar territory of trying to become a software platform company. I think it's going to be a challenge for them to create a competitive platform and to convince developers to create apps for yet a third software platform, after iOS and Android. With 300k apps on Apple's app store, RIM has a high mountain ahead of them to climb. It's easy enough to pick on BlackBerry, but that's not the only company Jobs is talking about here. Not really. Replace "RIM" with "Microsoft," and you get a pretty good idea of how Apple sees—or wants developers to see—Windows Phone 7. But let's not forget that if there's one thing Microsoft knows, it's software. That makes them a very credible threat. Jobs is happy to go phone for phone against RIM, but compared to Android he's more than happy to trot out the iOS statistics. Take away last quarter's 4.1 million iPads and 250,000 Apple TVs and Apple doesn't stack up quite so favorably. As for open versus closed, Jobs actually has a great point here—regardless/because of how open it is, Android's got no bigger problem than fragmentation, and its openness leads to generally horrible OEM skins that cripple their devices. I think at least now it's a battle for developers, and a battle for the mindshare of developers, and a battle for the mindshare of customers, and I think right now iPhone and Android are winning that battle. Framing the smartphone battle in terms of courting developers does two things for Jobs: one, courts developers. Two, defines success by a metric—quantity and quality of apps—that iOS has a seemingly insurmountable lead in. The more time that passes, the more I am convinced that we've got a tiger by the tail here. And this is a new model of computing, which you know, we already have tens of millions of people trained on with the iPhone, and that lends itself to lots of different aspects of life, both personal, educational, and business. So I see it as very general purpose, and I see it as really big. And the timing, one could argue about the timing endlessly, but I don't think one could argue that it's gonna happen anymore. 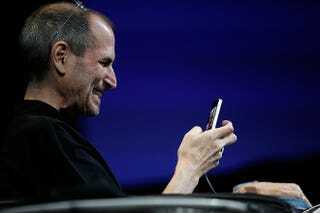 The more Jobs talks about the iPad, the more apparent that he sees it as his true legacy. And as laptops continue to give way to tablets, he'll be the guy who first gave them to us. I think part of [our iPad pricing advantage] is because we engineer so much of it ourselves. The A4 chip inside it is an Apple creation. Everything I mentioned from the battery chemistry to the enclosures, and we've learned a lot, from the miniaturization we've done on iPods and iPhones and we're a very high volume consumer electronics manufacturer, so I think we've learned a lot, developed a lot of our own components where others have to buy them on the market, with middlemen getting their cut of things, and I think we're systems architects and know how to build systems in a very efficient way. So I think this is a product we've been training for for the last decade. Vertical integration: do it right, and you've got a locked in ecosystem that's almost impossible to beat. Do it wrong, and you're Sony. So far Apple's done it right. Jokes! But seriously, Steve Jobs hates Flash. Flash hasn't presented any problem at all, as you know most of the video on the web is available on HTML5, and you know, having the iTunes media store and over 35,000 apps on the iPad dwarfs anything else, and we think that we have a very good product here that's going to be hard to match, and we're not done. This almost counts as modesty; it's true that much of the video on the web is available on HTML5, but also true that it may not have been—at least not yet—were there not a pressing need for Hulu and its ilk to get content on the iPad asap. I can report that in just a very short amount of time we've already sold a quarter million of them. Over 250,000. And we're thrilled with that. I think that it's a great product, and its $99 price point is very enticing, and I think that when we get the AirPlay stuff in place before the end of this year, it's gonna give another big reason for people to buy it. 250,000 devices aside, what's interesting to note is that Joel was right: it's AirPlay you need to be looking out for. That's where Apple makes its move on your living room. We think the current crop of 7-inch tablets are going to be DOA-Dead on Arrival. Their manufacturers will learn the painful lesson that their tablets are too small, and increase the size next year, thereby abandoning both customers and developers who jumped on the 7in bandwagon with an orphan product. Sounds like lots of fun ahead. The reasons Jobs gave for the death of the 7-inch tablet were manifold, but they all boil down to size. Too small for comfort, too big for Froyo. For Jobs, 10 inches is the tablet sweet spot, end of story. For consumers? They'll have their chance to decide soon enough. So much for those 7-inch iPad rumors. But more importantly, so much for Apple's 7-inch tablet competitors from Samsung and Dell. Until we get some decent hands-on time, though, it's hard to tell whether this is true—or that Jobs just hopes it is. You're looking at it wrong, you're looking at it as a hardware person in a fragmented world. You're looking at it as a hardware manufacturer that doesn't really know much about software, that doesn't really think about an integrated product who assumes that the software will somehow take care of itself. And you're sitting around saying, "Well, how can we make this cheaper? Well we can put a smaller screen on it, and a slower processor, less memory." And you assume that the software will somehow just come alive on this product that you're dreaming up, but it won't. Because these app developers have taken advantage of the product that came before, with faster processors, with larger screens, with more capabilities that they can take advantage of to make better apps for customers... Most [developers] will not follow you, most of them will say, "I'm sorry but, I'm not gonna go back and write a watered down version of my app just because you've got this phone that you can sell for $50 less, and you're begging me to write software for it." Hello, Galaxy Tab! Hello, Dell Streak! But hold on—this isn't just frivolous trash talk. Hardware fragmentation, and specifically the introduction of hardware that led to a terrible software experience, is a lot of what killed Windows Mobile, which is why Windows Phone 7 manufacturers have to adhere to strict device guidelines. We strongly believe that one or more very strategic opportunities may come along... we're in a unique position to take advantage of [them] because of our strong cash position... We'd like to continue to keep our powder dry because we do feel that there are one or more strategic opportunities in the future. Apple's doesn't buy up companies as frequently as Google or Microsoft, but when they do it's clear what they're after: Liquid Metal patents for sturdier devices. Lala to someday put iTunes in the cloud. PA Semi to make their own mobile processors. So whatever Apple's saving money for now, know that it's going to be big.